Unicorns have had a rough time lately. But they are not hurting for cash. In the second quarter of this year, companies valued at $1 billion or more raked in $8.78 billion in venture capital, the highest amount on record and 40% of all venture investment during the period. 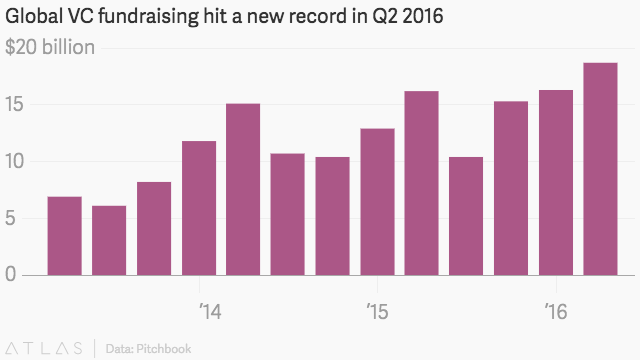 That’s double the share that went to the startup world’s unicorns last year, reports the private equity research firm Pitchbook. The analysis suggests investors are shoveling large amounts of capital into fewer deals, rather than splashing out on newer companies. Uber, Chinese ride-hailing rival Didi Chuxing, Pinterest, Snapchat, and Slack all closed VC financing this quarter, among the 1,906 deals closed during the period. A sluggish acquisition and IPO market is helping to push fast-growing startups into the arms of late-stage investors. Helped along by their own record breaking streak, the investors have been happy to oblige. Endowments and pensions, as well as hedge funds and mutual funds, have poured $35 billion into venture funds in 2016, breaking records in each of the first two quarters this year. Low returns elsewhere in the economy are fueling much of this trend. Venture funds claimed a 10-year annualized return of 11% as of September 2015, compared to 6.8% from the S&P 500 Index, the Wall Street Journal reports, citing investment adviser Cambridge Associates. But this isn’t making life any easier for early-stage companies. Investors spooked by market gyrations and massive startup markdowns cut their investments in early-stage companies to 25% of the total this past quarter, the lowest percentage in five years. While there hasn’t been a steep decline in the total amount of cash invested ($2.03 billion in Q2), the number of deals is declining. Financings with first-time venture involvement dropped to 525, down 38% from the same period in 2015, reports Pitchbook.